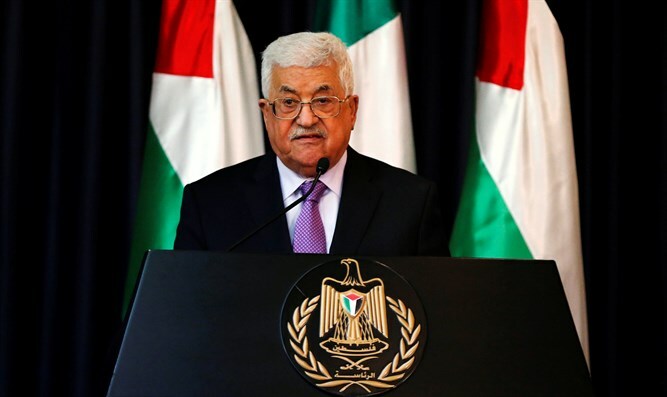 Conference of Presidents blasts PA chairman who said he has no intention of stopping PA's payments to jailed terrorists. The Conference of Presidents of Major American Jewish Organizations on Wednesday criticized Palestinian Authority (PA) chairman Mahmoud Abbas, who clarified he has no intention of stopping the PA's payments to terrorists in Israeli prisons. Palestinian Media Watch on Tuesday exposed Abbas's pledge which was made on the official Facebook page of his Fatah movement. "'Even if I will have to leave my position, I will not compromise on the salary (rawatib) of a Martyr (shahid) or a prisoner, as I am the president of the entire Palestinian people, including the prisoners, the Martyrs, the injured, the expelled, and the uprooted," Abbas was quoted as saying. A member of the Fatah Central Committee, Jamal Muhaisen, also quoted Abbas's promise to never halt the terrorists' payments, and emphasized that the payment of salaries to terrorist prisoners and "Martyrs" is not an issue of money, but rather is about the "Palestinian historical narrative". “In a speech recently delivered on behalf of President Abbas at the Herzliya Conference in Israel, senior Foreign Affairs and International Relations advisor, Nabil Shaath, described the payments as ‘a social responsibility’ to care for the well-being of its people,” they said. “There can be no real prospect for progress on the conflict between Israel and the Palestinians until the Palestinian’s end their policy of glorifying so-called ‘martyrs’, incentivizing murder and reinforcing a culture which legitimizes and encourages terror,” said Greenberg and Hoenlein. “The United States and other countries should insist on an immediate end to the Palestinian policies that enable the despicable practice of paying blood money to reward perpetrators of terrorism against Israelis and the bureaucracy that has supported them should be dismantled." The issue of the PA's payment to terrorists was brought up in a recent meeting in Washington between Abbas and U.S. President Donald Trump. Secretary of State Rex Tillerson claimed several weeks ago that the PA had stopped its policy of paying terrorists following pressure from the Trump administration.